T gets into these collection manias. Like when she wanted to collect all the Starbucks city mugs. She actually never got around to buying any because at the time, we didn’t have a home, much less a cupboard spacious enough to accommodate a global mug set. These days, she’s really been into kaleidoscopes. She thought it’d be cool to collect different ones from around the world. Again, she hasn’t actually gotten around to collecting them yet, mostly because the really good ones are really expensive. But that’s T, enthusiastic about life, but not so much that she wants to be burdened by acquiring and storing it. So it’s not surprising that T wanted to check out an art exhibit titled, The Kaleidoscopic Eye, at the Mori Art Museum. Although we both knew that there wouldn’t be any actual kaleidoscopes, we dig that modern art so we went. It’s a private collection with a theme of “perception and consciousness”, which is kind of a lazy way of saying, “yeah, there really is no theme.” I mean most art purports to address the issues of perception and consciousness. It’s like having a wine tasting party and having the theme as “grapes and alcohol”. There were some modern art celebrities represented, like a Tracy Emin neon work. We also enjoyed the mesmerizing film of Tibetan monks debating what existence is. A room full of disco balls that could have been a scene from MTV Cribs certainly tweaked my sense of perception. And a water fountain that had trace amounts of LSD, with venus flytraps hanging above it, certainly could have tweaked my consciousness. My favorite pieces were archways. One was a hypnotic passageway of lightbubs that flickered in various patterns, pictured above. 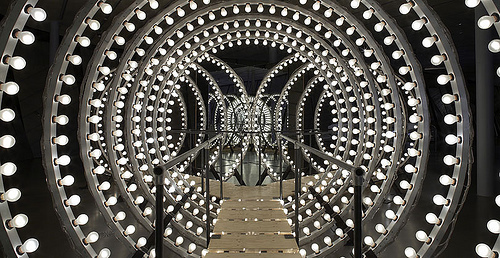 This piece by Carsten Holler (spelled with an umlaut over the ‘o’) was magnified by mirrors surrounding it. 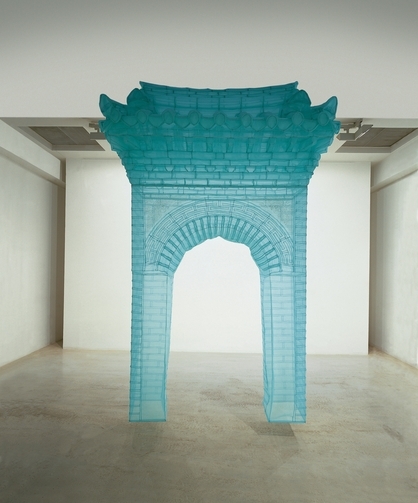 And the silk gate by Suh Do-Ho, was especially lovely. The gate was a hand-stitched model of the gate of her childhood home. It emanated a soft celadon light. The exhibit will run through July 5. The great thing about the Mori Art Museum is that it’s open late most nights, and the ticket price includes access to the Skywalk, which is the best view in Tokyo. I don’t know what I would have enjoyed more: ‘The Kaleidoscopic Eye’ or the ‘Doorways into Perception’ exhibit. Thank you so much for sharing news of both of these. thanks for that sweet offer! although, it seems she’s satisfied just to peer through them when we come across them. maybe you can take a picture through the kaleidoscope and post it on your blog. i think she’d be happy with that. awesome! thanks for sharing it. t says thank you.